An entrance gate into a Human Prison. 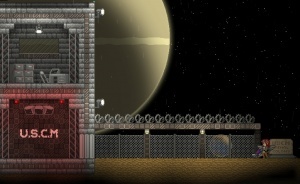 Human Prisons are a prison themed dungeon filled with escaped convicts, armed with both melee weapons and guns. These prisons are hostile, prisoners inside will attack on sight. The gate leading inside is clearly marked with a sign marked 'USCM Penal Colony'. The prison is usually segmented into multiple buildings linked by fenced off courtyards. Upon further inspection of the prisons, such as reading the graffiti, it can be assumed that the prison guards simply left. The convicts were told that they would return, but they did not, leaving the prisoners to fend for themselves. These dungeons can be found on any planet type aside from moons, any ocean worlds (including magma, arctic, and toxic), or garden planets. They don't have any specific planet type they're more likely to appear on. Basic treasure can be found in most containers while valuable treasure is in themed chests. There are no unique items tied to valuable treasure chests though Molotovs appear at greater rates. If enough tagged dungeon objects are placed together with a Colony Deed a unique Convict villager tenant can be summoned. 'Waz' Graffiti Decorative 0 Waz. Barbed Wire Trap 75 Ouch! I shouldn't get too close to that. Barred Door Door 95 A door made of thick metal bars. Barrel Fire Crafting Station 85 Fire in a rusted-out barrel. Basic Toilet Furniture 75 A normal looking toilet! Thank the stars! Broken Supply Cabinet Storage 125 Looks like it used to be filled with medical supplies - not any more. Bunker Vent Decorative 90 Sterile, recycled air whirs through the fanblades at a steady pace. Cafeteria Table Furniture 100 Just a typical cafeteria table. Calming Poster Decorative 90 There is no need to be upset. Cell Block Sign Decorative 60 The sign says, "Cell Block". Chained Metal Bed Furniture 105 A cold, hard slab of metal meant to serve as a bed. Decorative Support Beam Decorative 60 A decorative gothic corner. Dirty Mattress Furniture 95 This mattress is filthy! I swear I just saw something crawling around inside. Dirty Toilet Furniture 85 Looks like someone had a rough night. Display Light Light Source 75 A directional light used to illuminate items on display. Dripping Prison Shower Decorative 55 A shower. Perfect for a clean getaway. Electric Light Light Source 45 A cheap electric light. Eye Scanner Wire 90 A device to scan eyeballs and match them to personnel data. Fingerprint Scanner Wire 90 It scans fingerprints and matches them to personnel data. Floodlights Light Source 105 If I look at these lights any longer, I'll probably go blind. Fluorescent Light Light Source 75 Bright fluorescent light. Force Cell Furniture 150 Some sort of solitary confinement device, maybe? Gothic Arch Decorative 100 An ornate gothic arch. Graffiti Decorative 0 Graffiti. The writer seems somewhat peeved. Graffiti (2) Decorative 0 Graffiti. A harsh warning. Ignore it. Graffiti (get out) Decorative 0 The words "get out" have been written in blood. You can tell the writer was serious. Graffiti (skull) Decorative 0 A crudely-drawn skull. It looks cheerful. Graffiti (turn back) Decorative 0 Graffiti reading "turn back". Chances of it being adhered to: zero. Horizonal Metal Grates Decorative 55 Rusted metal grates meant for ventilation. Iron Chest Storage 70 A basic iron chest. Large Broken Mirror Decorative 100 Looks like someone had a case of the Mondays. Lightbulb (Hanging) Light Source 60 A bare lightbulb hanging from a metal rod in the ceiling. Loudspeakers Decorative 50 It's a set of loudspeakers through which people speak loudly. Mess Hall Sign Decorative 60 The sign says, "Mess Hall". Metal Barrel Decorative 50 A generic metal barrel. It's sealed. Metal Bench Furniture 110 A simple bench, save for the fact that the legs are nailed to the floor. Metal Ceiling Lamp Light Source 90 A metallic ceiling lamp. Metal Ceiling Lamp (2) Light Source 75 A metallic ceiling lamp. Metal Crate Storage 75 A metal crate. Metal Folding Chair Furniture 75 An uncomfortable-looking chair. Metal Office Desk Decorative 85 An office desk with a built-in monitor. Looks like someone was doing some coding. Metal Table Furniture 85 A simple metal table. Motivational Poster Decorative 70 That's not very encouraging. Notice Decorative 20 A notice written in ink. Old Radiator Decorative 55 The space heater emits a low, unpleasant hum. Pipe Fence Decorative 50 A fence fashioned out of heavy metal pipes. Rusty Filing Cabinet Storage 100 There were some office supplies and inmate files in this filing cabinet. Rusty Metal Block 0 Old metal encrusted with rust. Rusty Shower Decorative 55 A shower. Perfect for a clean getaway. If the water was actually clean. Security Camera Light Source 90 A security camera. An all-seeing eye. Security Camera Station Light Source 150 A set of monitors displaying the feeds from security cameras. Watch out for paranormal activity. Security Control Panel Wire 245 A control panel that appears to operate lights, doors and alarms. Small Broken Floodlight Light Source 70 A flickering light to set that creepy mood. Small Broken Mirror Decorative 50 Looks like someone had a case of the Mondays. Small Floodlight Light Source 75 It feels like I'm on stage! Small Prison Locker Storage 160 A good place to stash contraband. Small Turbine Decorative 55 It's a turbine. Y'know, for science. Tall Chain-link Fence Decorative 110 It's a chain-link fence. Tall Prison Locker Storage 100 A good place to stash contraband. Torture Bed Furniture 150 A torture bed. Terrifying! Thank goodness for the pillow. USCM Penal Colony Sign Decorative 100 USCM, huh? I wouldn't wanna be one of their prisoners. USCM Sign Decorative 80 What does USCM stand for, again? USCM Torn Memo Decorative 20 The paper is ripped and the words are smudged. Upright Torture Bed Furniture 90 A torture bed. Terrifying! Thank goodness for the pillow. Vending Machine Decorative 150 Ooh, what should I get? Vertical Metal Grates Decorative 55 Rusted metal grates meant for ventilation. Vertical Rusted Girder Decorative 70 Rusty old girder beams - can't be too safe. Water Cooler Decorative 60 It's one of those drinking machines people use to make small-talk. Wide Rusty Filing Cabinet Storage 160 There were some office supplies and inmate files in this filing cabinet. Wrecked Platform Platform 0 Rusty scaffolding. It doesn't look safe. This page was last modified on 4 December 2018, at 23:12.